She is the woman behind All That You Love Will Be Carried Away Dollar Baby Film. 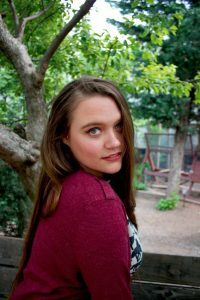 Kasey Rae: I am a filmmaker and writer who’s favorite thing is storytelling and trying to shine a light on things that are usually left in the dark. I live with my favorite person (my wife) and live in my favorite place, New York City, a very difficult place to live but its my version of living in a kingdom and it feeds me creatively like nowhere else. As a feminist, I try to employ as many females as possible, which is something that is so important to me. SKSM: Could you tell our readers the status of All that you love will be carried away or some updates? Kasey Rae: We are half way through the filming process, shooting on location as we are still finding locations! A pretty stressful part of the filmmaking process. SKSM: How come you picked All that you love to develop into a movie? What is it in the story that you like so much? Kasey Rae: It isn’t exactly that I liked the story that made me take it on, rather that it resonated so strongly with me, as if I knew the story so strongly before even reading it. I also knew the impact it can potentially have on an audience. SKSM: It is All that you love your debut as a director? Kasey Rae: It’s not my debut as a director but its definitely my debut making a film on this big of a scale. SKSM: You have a incredible cast and crew involved in this project. How did you convince them to play in All that you love? Kasey Rae: I feel so lucky to have found the group that I did! Everyone is so talented and above all, passionate! Passion plays a key point in this film so it was very important to me that the cast and crew had that quality in them so that it would easily carry across onto the screen. Honestly, no one took a lot of convincing and everyone was really excited to bring this story to life, especially my executive producer Sancha Spiller, who is the only one beside myself who has been with this film since its conception. Kasey Rae: My amazing friend, Jessie, was actually the person who told me about it after hearing it mentioned on a podcast. I went after it right away! I believe it was that evening I constructed my essay and wrote to him and his team. SKSM: How does it feel that all the King fans out there won’t see your movie? Do you think that will change in the future? Maybe a internet/dvd release would be possible? Kasey Rae: As a director, I definitely want the story to reach as wide an audience as possible since this is a story that truly needs to be seen and taken in, I believe it can really help people when they see themselves in the main character and relate to what he is going through. SKSM: I guess it’s very soon to ask this question but… where will the premiere be? Do you plan to screen the movie at a particular festival? Kasey Rae: It is indeed too soon! I don’t want to think on that side of things too much before the film is wrapped. I am very excited to hit the festival route though! Kasey Rae: Yes, I really love his works! Dolores Claiborne is my favorite King book so far, and while the book was best I loved the film adaption. Stephen King stories and Kathy Bates are a great combo, because Misery is one of the best film adaptions. The Shinning Will always hold a special place in my heart too. SKSM: Do you have any plans for making more movies based on Stephen King’s stories in the future? If you could pick -at least- one story to shoot, which one would it be and why? Kasey Rae: I have no plans for that at the moment, I am open to that but I know All That You Love is the perfect one for me to direct. SKSM: Are you working on another project besides this one? Kasey Rae: While I am constantly writing, this is the only film I am directing at this time. My production company, Skylah Productions, has a few upcoming projects and I am in pre-production stages of Going To Mars with a Sad Girl which also deals with themes like depression and suicide, though it shows it in a different light and different prospective. So those are definitely a few things to look out for and keep track of! Kasey Rae: I wouldn’t want to give it away. SKSM: What advice would you give to those people who want to be filmmakers? Kasey Rae: When the going gets tough, keep going. Always be open to new experiences, constantly look for opportunities, and make sure you have a story to tell that needs to be told. Don’t stay down when you are inevitably knocked down (once or twice). Have a lot of passion and heart to fuel you because it’s definitely a hard road to take! Kasey Rae: Thank you so much! I don’t know about ‘fans’ but I really hope my work makes its way to someone who needs it, and that they know they aren’t alone and can maybe see things in a way they never had before. Kasey Rae: Support indie artists! Let their work have a chance to impact you, no matter what form it comes in. and to all my fellow females out there, do not be discouraged when you don’t see people like yourself in positions of power and of choice, rather work on creating that path so that others may follow if they chose to do so.